Is Facebook Simplifying Privacy Settings? In fact, Facebook hasn’t shortened its policy, it’s merely broken it up and hidden many of the pieces. Throughout the 2,700 word document mentioned above, you will find hyperlinks to other policies that are incorporated by reference into the “Statement of Rights and Responsibilities” (SRR). Skeptical UK blogger Sophie Hobson followed all the links that pertain to ordinary Facebook members, pasted the scattered documents together, and ran a word count. The true size of the SRR is over 20,000 words, about one-quarter of a paperback novel. Then Hobson did the same with the Privacy Basics tutorial that debuted with the policy update. A whopping 500 words are devoted to explaining how members can protect their privacy; one word for every 40 words used to assert Facebook’s right to invade it. Well, obviously that means Facebook plans to sell your identity, your baby’s pictures, your home address, and every private message you’ve ever sent, right? The problem is the vague meaning of the word, “use.” Facebook needs the right to use what you put on it in order to do what you want done with it. But the right to use something is not the same as ownership of it, as any renter knows. Facebook cannot sell what it does not own. Nonetheless, many Facebook users are “immunizing” their pages against misappropriation with a very official-sounding notice that asserts their ownership of their intellectual property under various sections of the United States Code and “the Rome Statute.” Perhaps you've seen something like this: "I declare that my rights are attached to all my personal data, drawings, paintings, photos, and texts published on my profile. For commercial use of the foregoing my written consent is required at all times." Like a magic amulet that wards off evil, this paragraph of pseudo-legalese is supposed to stop Facebook from stealing one’s stuff. Actually, it’s worthless; by using Facebook you accept its SRR in its entirety, and you cannot unilaterally reject or modify part of it. It’s also unnecessary, as explained above. "Every Move You Make, Every Step You Take..."
It’s noteworthy that an image of a mobile phone is used throughout the new tutorial; desktop browsers don’t even get a mention, let alone a screenshot. Facebook is very focused on mobile devices and its Facebook App. That has the paranoid even more nervous than the target of Sting's obsession in the haunting 1983 mega-hit Every Breath You Take. When you install the Facebook app on your mobile device it asks for permission to track your location and movements. This sounds scary, but the purpose is not to build a dossier of your movements for the NSA. (The NSA can jolly well do that without Facebook's help.) The purpose of this tracking is to deliver location-sensitive ads to your device; e.g., a nearby shop that’s offering discounts, a restaurant’s menu special, happy hour deals at the bar you just passed, and so on. There's also a component of this location-awareness called Nearby Friends that lets you choose who can see when you’re nearby or on the go. It's a reciprocal deal, Facebook friends can only see your location information if they also share theirs with you. You can turn the Nearby Friends feature on or off, and of course, it only applies to mobile devices. Facebook says it’s trying to make it simpler and easier for users to control who has access to their data, who can contact them, and what ads they see. But the one control that users want most “is not technically feasible,” according to the company. Facebook is never going to give you a one-click means of opting out of all advertising. Of course, you ultimately decide if you want to use Facebook or not. Those who do must agree that the benefits outweigh the privacy concerns. I'm in that camp, because Facebook allows me to connect with friends and family in a way that would otherwise be impossible, or at least tedious. But knowledge is power, so I do recommend that Facebook users pay attention to what, where and how they are sharing information. To access Facebook privacy settings on the desktop, click the nearly-invisible dark blue padlock icon on the right side of the slightly less dark blue bar on the top of your Facebook window. On mobile, click the hamburger icon (three horizontal bars) then scroll almost to the bottom of the page and you'll find Privacy Shortcuts. Most recent comments on "Facebook Embraces Privacy and Simplicity (Not)"
I don't enjoy puzzles as much as when I was young. I thank GOD that I use Facebook almost as much as I use shoe polish. (I wear tennies very day.) If I was a power user, then this would have been a very helpful article. As it is, it is merely informative and enjoyable. But I do plan to try and find those well hidden links. Hi Bob, you forgot to mention the 4th "camp" that are part of "Don't Give A Hoot-ers". I think the best security/privacy advice, for those who (must or have to) use FaceBook, is to get a cyber-identification, which does not in any way identify your true and real-life identity. Your friends/relatives should be made aware of this change (e-nome de plume) and you are done! Hope this does not come off as trolling! Bob, thank you for expounding on the recent update on Facebook. I trust what you have to say and depend upon you for matters like Facebook. Would you be kind enough to explain your reference to "the Rome Statute"? Wikipedia explains it as EU's establishment of 'four core international crimes: genocide, crimes against humanity, war crimes, and the crime of aggression'! EDITOR'S NOTE: I'm only reporting that some people reference it when posting those (pointless) "ownership notices" on their pages. I can't tell you why they do so, but perhaps they think it sounds impressive. I let my grandchildren talk me into joing FaceBook a few years ago so that I could keep in contact with them and read about what all they were doing. Before signing up with that outfit....we rarely received any SPAM. Just 2 or 3 a week or so, Well.....within a month of my signing on we were getting 20 to 30 SPAM and PHISHING messages every day. Hmmmm. Now how do you imagine that could happen? Huh? I canceled my membership with FaceBook. We still get some SPAM but it has gradually reduced in amount. Probably should have changed my E-mail address but that would have entailed a lot of other problems with other contacts. Fortunately Yahoo/AT&T E-mail service is fairly good about filtering out most of the bad stuff. Nothing is ever perfect, especially when it comes to FREE stuff like Facebook, so it always pays to do a risk to reward analysis. I am a fan of Facebook for non-private communications purposes and it has served me very well over the years, including following government and academic activities as well as getting bargains every now and then from viewing the ads, which in my opinion are not overly intrusive. To open an account with Facebook, you can provide as much information about yourself as you wish, so you can control your own privacy. Google once did try to force users to provide full identity, and users responded with always full exodus en masse, and Google had to reverse that policy. EDITOR'S NOTE: As I mentioned, you must opt in to this feature, you can control which friends are able to access your location information, and they must agree to allow you to access theirs as well. 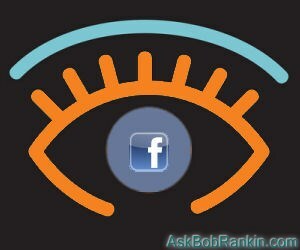 I don't do social networking because for me (unlike you Bob) the potential problems outweigh the benefits. Plus I find texting, email and actually speaking to people serves me well in communicating with friends, family and the outside world. I do have family members and friends who do use Facebook and other social networking sites - when I ask them how they feel about their personal privacy regarding the terms and conditions of using such sites, the answer is mostly 'don't know and don't care'. I would imagine this accounts for most users - the ones that do have a concern probably just use it and keep their fingers crossed. I decided long ago not to use Facebook, or any other social network. I don't believe any of them can be trusted. EDITOR'S NOTE: What about your ISP? Google? Microsoft? Apple? The more I hear and see what Facebook is doing ... The less and less, I log on to Facebook. I am coming to the conclusion, that IF, my relatives and friends want to truly contact me ... They can do it by email. I have also, come to the conclusion, that I honestly DO have life, without Facebook. I used to be on FB almost everyday. This year I have cut back a good bit, even though I enjoy it. Spending a little more time on Twitter. But,I'm glad I subscribed to your updates, Bob. It's only been maybe three weeks, but I am really interested in your information. I like people who aren't afraid to speak the truth.